coronal MR images document invasion of the cavernous sinus by the macroadenoma and a tumor sleeve extending around the carotid artery (arrow). Fig. 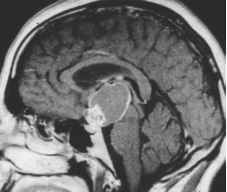 11.33 Sagittal MRI after contrast administration shows a tumor that accumulates contrast intensely in its periphery while its center appears to be cystic. The tumor has invaded the third ventricle. This is a craniopharyngioma. chordomas of the clivus (Fig. 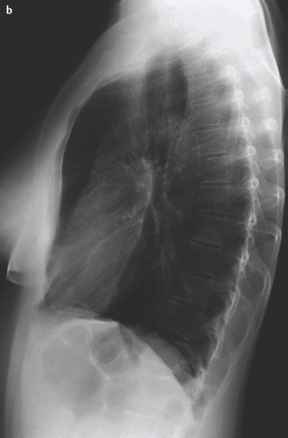 11.34b) or epidermoids (Fig. 11.34c) can also lead to compressive symptoms in the perisellar area. Giant aneurysm: A giant aneurysm can originate anywhere in the circle of Willis and extend cranially, occasionally causing a compression of sellar and/or perisellar components (Fig. 11.35). 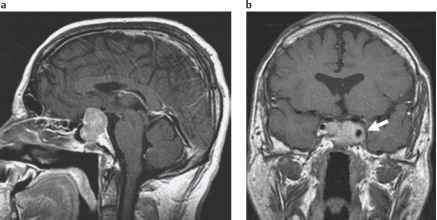 "Empty sella": The term "empty sella" designates a CSF-filled herniation of the meninges into the sella (Fig. 11.36) that can compress, for example, the pituitary gland. A similar situation (and image appearance) may of course develop after sellar surgery.